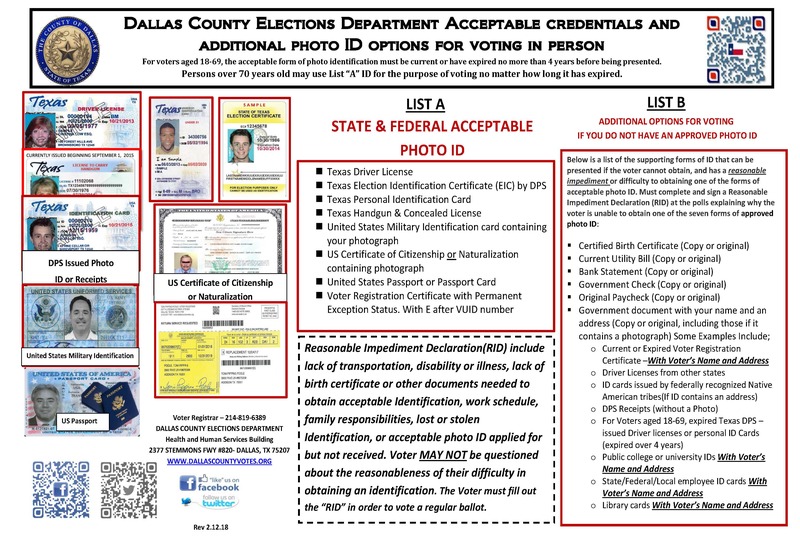 Voters who do not have, or cannot obtain an ID from List A may still vote a regular ballot after completing a Reasonable Impediment Declaration (RID) noting the voter’s justification to not obtaining an acceptable form of Voter ID, and stating that the voter is the same person on the presented form of supporting form of ID before voting. In addition to the Declaration, the voter must show one of the forms of identification or information from ID List B. This website and the above files are for informational purposes only. While we endeavor to provide timely and accurate information, we make no guarantees. For additional questions, please contact the Dallas County Elections Department at (214) 819-6300.